Had I known what I know today, I would’ve changed my eating habits long ago. When we are young, we don’t look at the long-term affects it will have on us later in life. About 18 years ago, I was diagnosed with fibromyalgia. At the time, I was seeing a rheumatologist, who wrote out how many anti-inflammatory drugs I could take in one day. All I could picture was how my liver would look like when I was 50. It wasn’t the only thing that ailed me. I had severe migraine headaches, chronic bladder and yeast infections that seemed to go in a vicious circle, I’ve had to have cataract surgery at age 48, and I’ve recently developed thyroid problems. You don’t have to be an alcoholic or drug addict to have addictive behavior. Little did I know, the symptoms my body was broadcasting was a sign of my years of chronic sugar intake. It took me years to figure out what had contributed to all this. At first, I looked to my doctors to answer my questions, but they answered me with pain killers and antibiotics (so much so that I cannot take them today). I wanted them to tell me how to get healthy naturally. However, I learned that kind of practice is not a part of conventional medicine. I took an oral antibiotic called nystatin for 5 years! After my new doctor wouldn’t renew my prescription, my body went through a month of withdrawls. My body had become dependent on it. After reading and researching my issues, I decided to eliminate processed alcohol, dairy, processed foods, sugar and wheat from my diet. It’s not so easy to wake up one day and decide this. It takes years to change habits. We are influenced by many things when we eat: media, culture, peers and family. It takes a lot of strength. 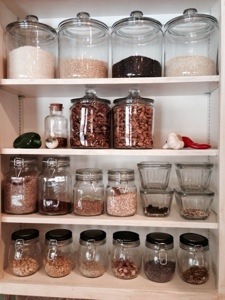 When starting a healthy lifestyle, you need to start by revamping your pantry and frig. I looked at labels and threw out processed foods. There are things that have made their way back into the house (through my husband), but I don’t use them and no longer have a palate for them. I kept quality vinegars, coconut palm sugar, coconut amino acids (a soy sauce alternative), coconut & olive oil and coconut milk. I do use some honey, nuts and grains (non-wheat), but I limit my intake of them. Life is better when you make healthy changes. When eliminating sugar, I felt clean, had no sign of yeast or bladder infections, my aches and pains disappeared and my thoughts were clearer. As I started to eliminate wheat, I felt less irritation in my intestines. My drink of choice has become water and is the one thing that makes me feel the cleanest. When I eliminated alcohol, I didn’t have to wake up feeling sick after consuming only one drink the night before. I only use alcohol in cooking as most of it burns off in the cooking process (and the quality of it does matter). After giving up dairy, my migraines have disappeared. Growing your own food makes a difference. When moving to our farm over a year and a half ago, our goal was to become sustainable. So far, we’ve put in a greenhouse and large garden. This is the most important way we’ve been able to impact our health. I am convinced that healthy foods prevent sickness. Cooking from scratch and using quality ingredients has been instrumental in helping me feel healthy again. It has motivated me to share and influence others in positive ways through cooking. I want people to know there are health impacts to eating unhealthy foods. We do have a choice when it comes to vegetables with pesticides, meats with antibiotic/hormone and chemically processed foods. There are better alternatives. It was another great workshop in the Cooking with Alcohol Series, part 2. We had 7 participants. We grilled a tequila chicken marinaded in a homemade low-carb margarita mix (all from scratch). Black beans, rice and a farm fresh salad accompanied the dish. This gracious meal consisted of only 520 calories! There was no guilt and the guests left no left-overs! This workshop focused on marinading. When meat is marinaded in alcohol, it bonds to the molecules and also helps carry fat soluble compounds like garlic, herbs and other seasoning into the meat. Since we were doing a Spanish Style dish, I thought it would be fun to introduce some Costa Rican flavors to the students. 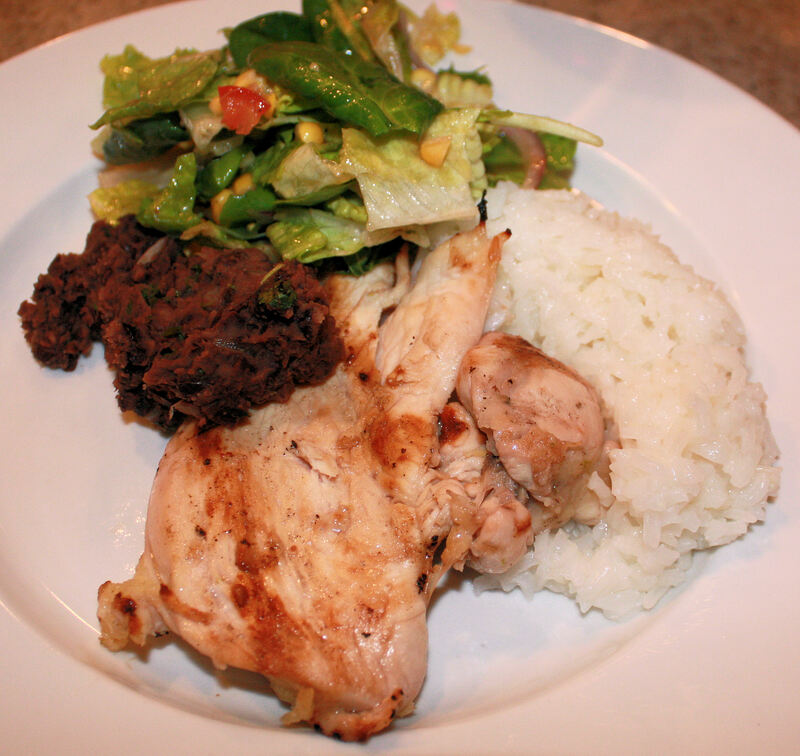 Tica, which is short for Costa Rican was the style for our Tica Black Beans and a Tica Salad Dressing. We used a Costa Rican product called Salsa Lizano. The salsa is the consistency of a curry sauce, but tastes totally different. It’s not like the salsa Americans know. Costa Ricans use the salsa (or sauce) as a condiment. It’s perfect for marinading meats, using in tomato salsa, ceviche, arroz con pollo (chicken with rice), braising meat, using in guacamole or as a condiment in tacos. You can find the salsa on ebay, amazon or in Latin markets. In every workshop, we give a gift related to our class. Kerry won our drawing for a 32 oz. bottle of Salsa Lizano. Congrats to him. Each participant goes home with our workshop recipe cards. We’re happy to announce, our recipes now have the nutrition info on the back! 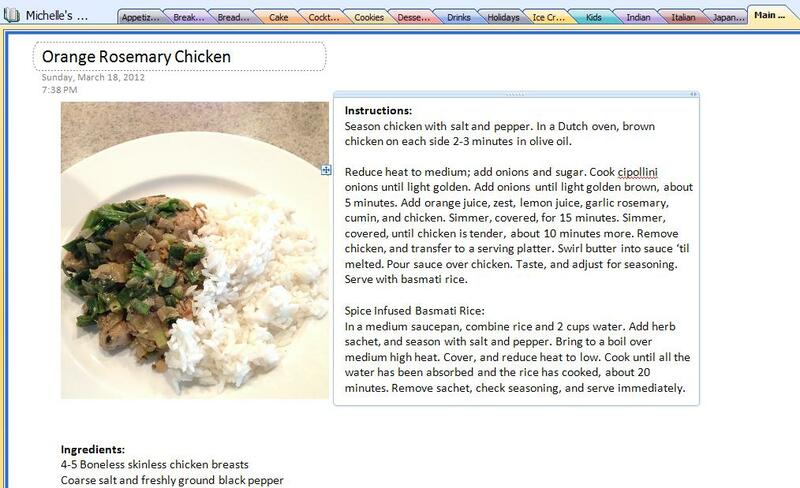 I was lucky to find that an internet site called, Spark People has a recipe calculator. The site allows you to save your recipes privately or share them online. There’s quite an extensive ingredient database. I was pleased to find Salsa Lizano as one of their ingredients! At the end of our workshop, one of our guests exclaimed, “Your workshops are the one thing I really enjoy.” Thank you for that! We try very hard to create a fun and unique experience for all our participants. As the weather warms up, we’ll be taking some of our workshops outside. Kerry takes gets a look at our nutrition info. Unlike the recipe boxes we had when I was growing up, I have an electronic recipe notebook I’ve created in a program called One Note. It’s a nice little journaling software that allows you to create notebooks with tabs and pages within tabs. You can keep your recipes in real time. If you have Microsoft Office, then you probably have One Note. It’s good for a variety of different things. 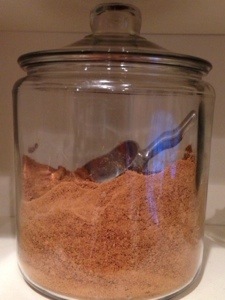 However, this is where I store all my recipes now. It’s a nice replacement to the binder of unorganized recipes I used to have. I’ve added my entire recipe collection to this journal. As I find new ones on the web, I copy and paste them along with their photos. It shows where you got the recipe when you paste; At the bottom of the paste, the url comes with it. I find this handy when I like the author and would like to return to their site for more recipes. As I use the recipes in my notebook, I edit the recipes and make notes. Sometimes, I even replace the photos with my own just to personalize it. 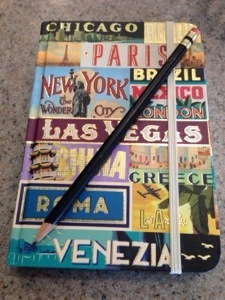 One of the great things about recipe journaling is that you can pass your notebook onto family members like your kids. My kids have a copy of my notebook with all the recipes they grew up with. It’s my legacy to them. If you love to cook like I do, you may find yourself doing a little adlibbing when it comes to following a recipe. Reading between the lines is often necessary in cooking. If you’re like my daughter, that may be a scary thought. What if it doesn’t turn out right? Know that it if doesn’t, that’s ok. That’s how we learn. After you do it awhile, you’ll become attuned to the ingredients that work best together. I’ve often said, “Let your taste buds be your guide.” The next time you’re at your favorite restaurant, ask yourself, What ingredients do I taste in this dish? Notice the ingredient combinations and how they compliment each other. I once visited a restaurant 3 times just to figure out the ingredients in a mushroom salad I was in love with. I even talked to the server to see if I got the ingredients right. She was nice enough to let me in on how they made it. Don’t be afraid to omit, add or substitute. Make sure you taste along the way. If you add, add a little (you can always add more). If you omit, make sure the dish can hold it’s own if an ingredient is taken away. If you substitute, make sure the new ingredient compliments the dish or would taste just as good, if not better with the new ingredient. Base recipes can help you build a great dish. Thankfully, with the web, it’s easy to find those kinds of things. For instance, if I have asparagus on hand, I’ll look up recipes for asparagus. I may not even follow the recipe. I’m just looking for a base recipe so I can use the ingredients I’ve got in my pantry or frig. A recipe can have multi-purposes. I love taking a recipe that was meant for one thing and using it for something else. For instance, I’ve got a recipe for tequila chicken that was meant to top a salad. I use it 4 different ways: in a crock pot with salsa, grilled, on pasta or in tacos. I have another recipe for Oriental dressing that was originally designed to dress a pasta dish. It’s one of my kid’s favorite recipes. I use it as a Chinese Chicken Salad Dressing. Use your imagination. Our business is based on substituting less healthy ingredients for healthier ones. There’s a great article on cooking with Greek yogurt you gotta check out. It’s a nice example of a substitute reference. Make sure you keep your recipes in a recipe journal. You’ll be able to make notes and save photos alongside your favorite recipes. Read my article, Cooking Outside the Recipe Box for tips on creating a recipe journal. I do not save the recipes I don’t absolutely love. When you have this regimen, you always end up with dishes that will thrill most of your family and friends. Cooking good food makes everyone happy! We had 6 people here for our Wednesday night workshop, Cooking with Alcohol. We made my favorite classic old school dish, Chicken Marsala paired with Spinach Risotto. What I love about the Chicken Marsala recipe is that the chicken is not breaded and is still one of the true authentic Italian recipes out there. Thankfully, since it was such a nice night, everyone started by enjoying a beverage out by our outdoor fireplace. Before we tackeled our two recipes, we took a trip to the greenhouse to pick some of the first spinach of the season to use in our risotto. 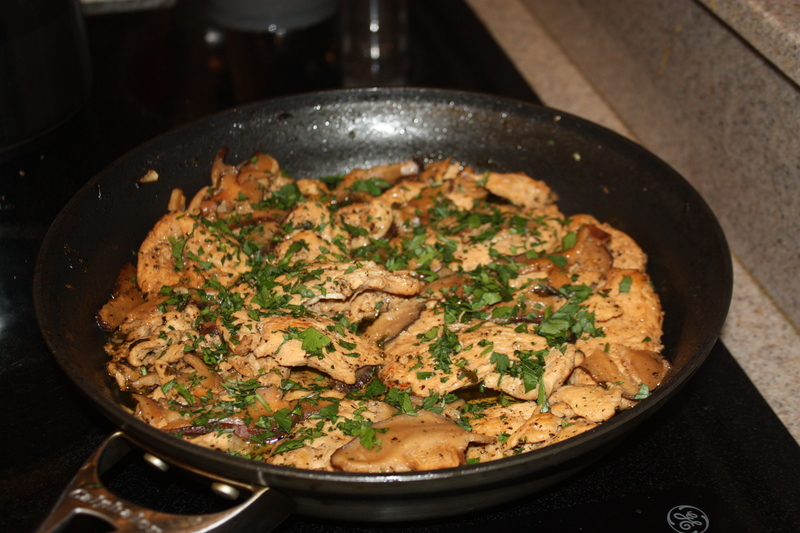 Chicken Marsala is one of the best recipes to show a variety of techniques such as marinading, tenderizing, butterflying chicken, sauce reduction and clarifying butter. Some of the girls had never tried these techniques, so it was a great learning opportunity for them. The risotto (also known as arborio rice) was also a learning opportunity since most hadn’t tried their hand at making this saucy kind of rice. Making risotto is more of a hands on art in contrast to making rice (in which you boil it and put on the lid). 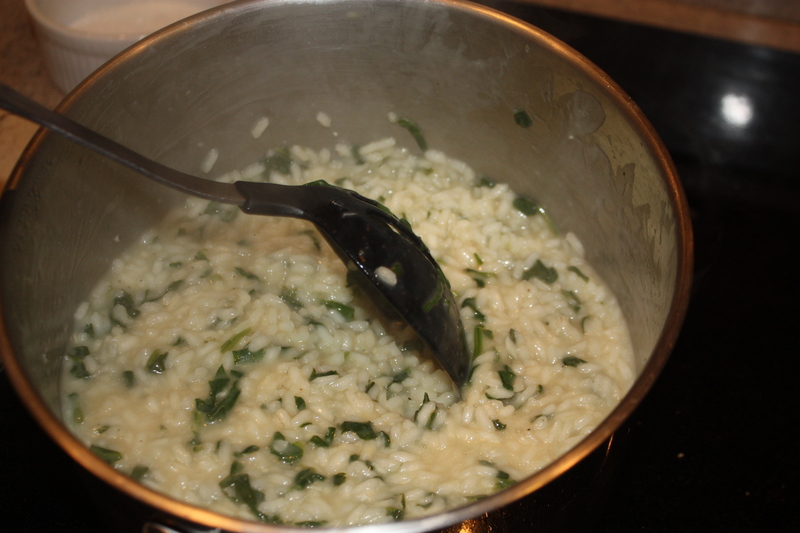 Risotto requires that you add liquid a cup at a time until the liquid is absorbed. It can take up to 5 cups of liquid for a cup of risotto. You add the liquid until the rice is soft and not al dente. We finished it off with Parmesan and spinach. It made a nice accompaniment to our chicken. When it came time to plate up, we were ready. Along the way, I encouraged everyone to sample the dish so we could make adjustments if necessary. It’s especially nice to make a dish as a group and then sit down and enjoy. Everyone is part of the end result and feels connected. Each of our workshops have been unique. I think each individual brings something different; in the way they perceive cooking and their enthusiasm. I’m looking forward to the next two classes: Tequila Chicken and Homemade Marinara Sauce. It’s starting to warm up around here. Hopefully the coldest days are behind us. Just like the weather, we’re also getting warmed up. We are looking forward to using this year’s fresh produce in our workshops. Our greenhouse starter plants are doing wonderfully: carrots, bunching onions, snap and garden peas, arugula, spinach, cabbage, romaine lettuce and mesculin as well as a variety of herbs. 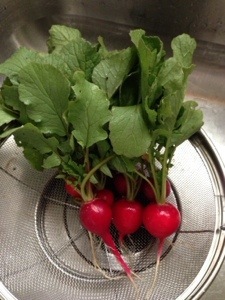 They will go beautifully with our newly posted workshops on salads and appetizers. Come join us for some fresh, light, healthy and delicious workshops. Stay posted. As the weather gets even warmer, we’ll take some of our classes outside. We’ll dine farm style in our garden and do a little barbecuing.